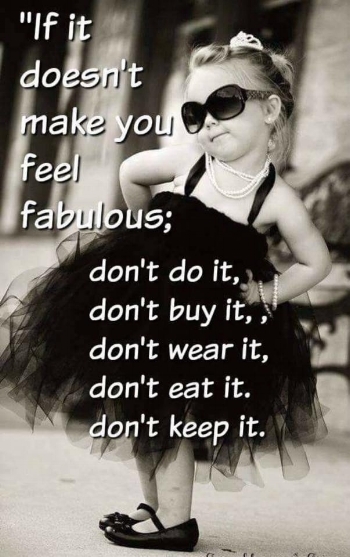 If it doesn't make you feel fabulous, don't do it!" While I love this meme (and the pic is gorgeous), I reckon it's a truthism - something that we take to be true ..... but it's not. Sometimes we land a big role and ..... it's not easy. In fact it can be downright uncomfortable and we wonder if we've made the right decision. But the notion that big, important work, truly making a difference is somehow "easy" is a myth. Who says that leading was supposed to be easy or comfortable anyway? There is a saying in the yoga world "the way we do anything is the way we do everything", which refers to the way we tackle challenges on the yoga mat mirroring the way we tackle real life challenges out there in the real world. and you'll probably react in the same way in a new role that's a stretch or challenge. Every one has their comfort zone and it varies person to person. But where are the edges of yours and how can you learn to sit with discomfort for a little longer? Because we all know that that's where the magic truly happens. A growth mindset along with Just In Time Learning (JITL), are powerful approaches to tackling big, hairy, scary and audacious goals - and making them happen despite discomfort. Be prepared to do the work. Not exactly the stuff of feeling fabulous, that's for sure. Another powerful tactic is to align with a sense of purpose. When we connect with a deeper sense of "why", when we can see the bigger picture, we are far more motivated, and able, to make a far bigger difference, despite tough times. Hear from TED Women speaker, psychologist Susan David, as she shares how the way we deal with our emotions shapes everything that matters: our actions, careers, relationships, health and happiness. In this deeply moving, humorous and potentially life-changing talk, she challenges a culture that prizes positivity over emotional truth and discusses the powerful strategies of emotional agility. There is a line in the sand that you do not want to cross despite the right mindset or a great sense of purpose. Knowing where your line is, and having an exit strategy or a risk mitigation plan in place if you cross that line will help. Because there is nothing quite like that deep sense of reward that comes from emerging from tough times. And with your new sense of achievement and growth, anything might be possible. My take? Get comfortable with discomfort – it’s part and parcel of a difference worth making. After all, a diamond isn’t created overnight or without pressure is it? And I'm aiming for diamond status - you?